Bright luminous canna Valentine is an unusual colored red canna that’s sure to catch the eye. Its bright flowers will attract attention but they are not glary like some other red cultivars can be, to me they appear as if they are sparkling in the garden when viewed. Upon very close examination and with a sharp eye they are seen to have an overlaid glistening of tiny little sparkling spots on them. 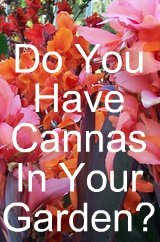 Valentines flowers are colored cerise and it is classed and often called as a blue red canna, this meaning it has no orange flush or shadings on the flower which many other reds have. 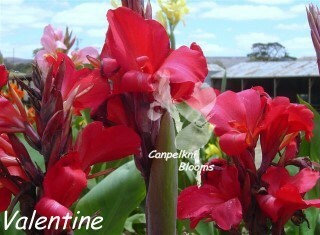 Valentines flowers are of medium size with some slight cream brushings in the throat of the labellum and on the stamen. Valentine is a medium growing plant reaching up to 1.2 meters tall in my garden when in flower, this variety is also capable of setting seed, and this is another famous hybrid raised by Herb Kelly. The flowers on Valentine also closely resemble those of the cultivar P. J. Berkman at first glance the flowers appear the same.